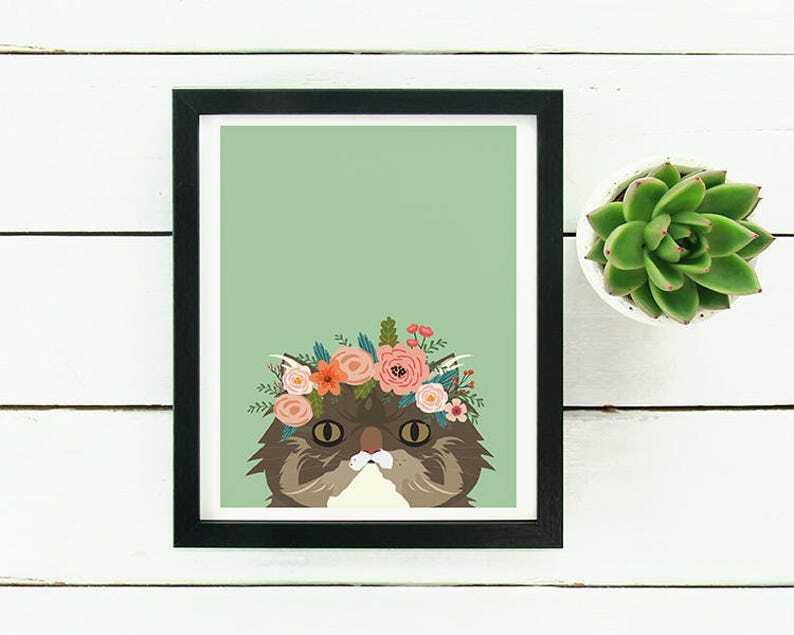 Perfect print for cat lovers! Printed on acid-free, heavyweight, matte paper. Looking for another cat breed? See our many other custom and non-custom pet art options in the shop! These are one of my most favourite purchases for our wedding, I absolutely love how they've turned out, thank you so much! Love the tweak that you made from my original photo! Payment in full is required before work begins on custom illustration or invitations. The minimum is 25 for printed invitation/paper goods orders, after that, you may order as many as you wish. If you are uncomfortable paying the full amount for your full set of printed invitations/paper goods before receiving a proof, you may opt to pay $25 for a proof to be generated, and then pay the full balance before printing begins. Alternately, there is a DIGITAL ONLY option for many of the listings in my shop. You can purchase this option to get the ball rolling and change your order to a printed order after we arrive at a final proof. CUSTOM ILLUSTRATION & INVITATIONS/ SAVE THE DATES ETC. - Since most of the products in my shop are completely custom - I do not accept returns or exchanges once work is complete. For ALL custom products I offer, you will receive a digital PDF proof. This is your chance to catch any errors you see or make changes until you are completely satisfied. After approval of your proof, any errors are you (the customer) responsibility. Colors vary from monitor to monitor, so it is impossible to guarantee the exact color you see on your screen. Slight variations between what you see on a brightly back-lit monitor and a printed piece and between different printers, are to be expected. PLEASE NOTE: After accepting your final proof, changes will require a fee. Please check final proofs carefully! CANCELLATIONS - Custom work requires scheduled time be dedicated to fulfilling each order and holds a "place in line" in my order queue. For this reason, cancellations of custom illustration MUST be made within 36 HOURS of placing your order. Cancellations after this point will not be honored. After final payment is received, turnaround time for printed invitation orders is typically 2-3 weeks, though at extremely busy times, it may extended slightly. If you need your order expedited sooner, rush orders are available. Prints and samples will be shipped within 5 business days from purchase date. Orders that include envelopes may arrive separately, as they are in some cases, shipped directly to you from my supplier. All orders are shipped through USPS. Unless otherwise requested, orders are sent Priority (allow 2-3 business days in the US for delivery). Shipping times are estimated and not guaranteed by USPS. If you need your order shipment guaranteed, please contact me to upgrade the shipping method to Express. In most cases, shipping charges are calculated for US customers. International orders are welcome (but additional shipping charges will apply)! Arrival time varies by location. Due to the extra cost of mailing prints internationally, I strongly encourage international buyers to take advantage of the Digital Only option I offer for custom family & pet portrait prints. It is much more cost effective to send the digital file to a local printer near you than paying the high cost of shipping a print internationally. Once an order is shipped and leaves my possession, I cannot be held responsible for it's whereabouts or delays in delivery, sorry! Damage to items during the shipping process will be handled on a case by case basis. Import taxes, customs duties, and/or fees imposed on international orders (outside the US) are the buyers responsibility. I am unable to predict these fees, they vary by location. I am a one person business and try my very best to accommodate orders as quickly as I reasonably can and offer convenient turnaround times. However, I work on a first come, first serve basis with a consistent queue of orders. In most cases, the projected delivery dates on orders are accurate. If you have a pressing deadline that needs to be met relatively quickly, please contact me to discuss a rush order. For holiday cards and all custom illustration, please be patient. I will have a proof to you as soon as it is ready (usually within 5 BUSINESS days). During the busy holiday season, extended longer than normal wait times are to be expected and will be communicated. I try to respond as quickly as possible to emails, Etsy messages and edit requests - please be patient. Note: a response to messages sent during non-business days can be expected on the next business day. All prints are shipped unframed and flat mailers. What revisions/changes are allowed for custom invitations/illustration? I offer 3 FREE REVISIONS. Additional revisions beyond 3 may require an additional fee. CUSTOM ILLUSTRATION - Minor changes to appearance attributes and attire/outfit, text, and color are acceptable. Please provide forward facing photos so I am able to see faces clearly as well as relative heights of all people pictured. INVITATIONS & PAPER GOODS - Color and text customization (wording and font) are acceptable. If additional design time is needed for specific requests, I offer a selection of different levels of custom design available for purchase that can be added to an existing order or purchased on its own for something completely custom. Do you offer Printing & Finishing? Yes. Every design you see in my shop has optional printing & finishing services. We will do the printing, cutting, & finishing for you and ship a high-quality printed product including envelopes in your choice of color. Custom family and pet portrait prints are available and size options can be found on each listing under the Delivery Method drop-down menu. Where should I send my photos after I place a custom illustration order? Please send photos via Etsy convo as attachments. You can only attach 3 at a time, but you may use multiple messages in the same thread to send as many as you wish. This helps me keep everything together in one place for you. If for whatever reason, you are having trouble uploading your photos, you may email them to tara [at] deaandbean.com. How do you send proofs? In most cases, I send proofs back in the same Etsy convo that you started when you sent me your photos/information. Please remember to check back to your Etsy account to see if a proof has been sent. I do not want to have to chase you down to check your proof. I some cases, I will use email to send large documents. Please be sure the email address associated with your Etsy account is accurate. Turnaround times vary based on the different types of products I offer. The following represents my typical turnaround times but are subject to change during exceptionally busy times. Do you sell printable digital files? Yes. If a design is available as a digital file, that option will be available in the Printing & Finishing or Delivery Method drop-down menu in it's listing. Can you create additional matching items such as programs, menus, table numbers, etc. to match the invitation? Yes. Additional insert cards to match the invitation, such as accommodations, directions, website cards, etc. as well as any paper goods you need for the big day exist for each any every design in my shop. Many of the matching items for an invitation or other product have their own listings in my shop. You may check through the other shop categories to find such items and many are linked in the item descriptions. If you aren't finding what you're looking for, contact me if you wish to include something else! What's the deal with the destination boarding pass suite of items? Additional matching items in this suite are available a la carte. However, if you are interested in ordering multiple items, let me know and I will create a custom listing for you with everything all together for ease. The luggage tag Save the Date is NOT printed on magnet medium. It is printed on heavy white card stock and a magnet is adhered to the back. Both a luggage tag Save the Date AND enclosure card exist and are used for different purposes. The Save the Date has a map of whatever destination you choose (it can be anywhere! ), the enclosure card is used in conjunction with the invitation for extra info. How many stamps are needed to send the invitations/save the dates I ordered? In most cases, a standard stamp is sufficient (even on magnet-backed save the dates). However, depending on any additional items you may be enclosing in the envelope, I recommend waiting to buy postage until you can take a completed one to the post office to weigh it. I do not want to advise wrongly. I want a postcard invitation/save the date/rsvp card. Can you do that? While I recognize that postcards are convenient and cost less to mail, the mail sorting process is brutal, often resulting in damage and markings on your lovely paper item. The very reason envelopes exist is to protect whatever is inside. For this reason, I highly suggest and strongly discourage against post cards for wedding paper goods of any kind. I have seen MANY times, rsvp postcards either never making it back to the sender or being damaged beyond recognition. It breaks my heart. Protect your investment and use an envelope!